In the early 2000s, the nitrates in Kutztown’s water supply were approaching the maximum safe levels for drinking water. The nitrates were related in large part to farms in the area. This situation energized a partnership of non-profit organizations, government agencies, and private entities to ensure the safety of the city’s water supply, in part by helping local farmers install conservation practices that protect and improve water quality. As part of this effort, USDA’s Natural Resources Conservation Service (NRCS) delivered additional funding for voluntary conservation assistance through its National Water Quality Initiative (NWQI). For years, dairy farmer Daniel Weaver faced challenges that made his life harder and affected water quality in his area. He hauled manure every day because he had nowhere to store it. And, his cows watered and roamed in a branch to Saucony Creek that runs through his property. This reduced the health of the stream and of his herd. That is before he formed a relationship with NRCS staff at his local USDA Service Center. With NRCS’s help, Weaver was able to implement conservation practices that improve the operations of his farm in a way that also protects the ground and surface water flowing through his property. First, NRCS helped him develop a nutrient management plan for his property. The Environmental Quality Incentives Program funding, commonly known as EQIP, enabled him to install a manure storage tank that alleviates the need to haul manure daily. The new storage capacity allows him to control the rate and timing of manure application on his farm, which are key factors in achieving healthy soil and clean water. He also says that it has helped him save on labor and fertilizer. “I think it should be mandatory for farmers to have a manure pit,” he said. 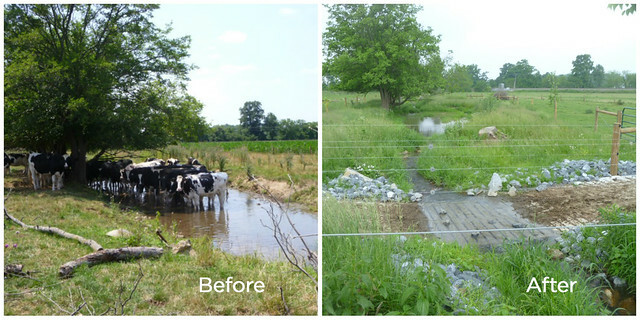 Streambank fencing and an animal crossing were installed to keep cows from contaminating streams and creeks that crossed their pastures and therefore the downstream rivers and lakes. In the five years since installation, vegetation has grown on the stream banks, creating a buffer for the stream and the crossing controls the cows’ access, thereby limiting pathogens and nutrients from entering the water. Not too far away, Harlan Burkholder owns and operates a 100-acre row crop and beef cattle farm. 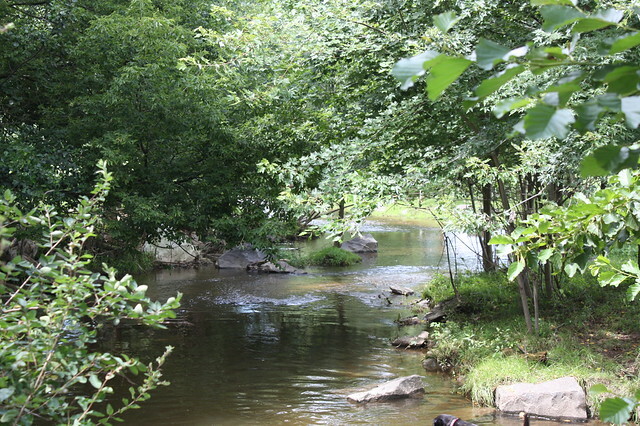 He also worked with NRCS and other partners to improve water quality in Saucony Creek. 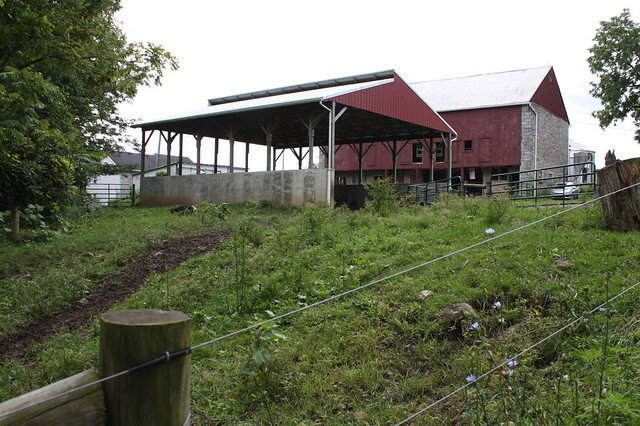 When Burkholder bought his farm in 2005, manure was being stored on the ground near the creek that runs through the property because there was limited space near the barn. He had to spread manure on the fields often to keep it from piling up. Realizing that it’s best to spread manure in the growing season and store it in the winter to avoid runoff, he developed a nutrient management plan. After applying for NRCS financial assistance, he worked with NRCS to co-invest in a manure storage structure. Now, Burkholder is able to store manure over the winter so he can spread it at optimal times. He is grateful for NRCS’s help. “As a beginner, there’s no way I could have spent money on something like this,” he said. It’s working so well that he’s sharing his knowledge and experiences with other farmers. Together, NRCS and its partners have helped more than 20 farmers in the watershed get conservation on the ground. In fact, NRCS has invested more than $2 million in targeted assistance in this area alone. And, the residents of Kutztown are taking notice. Just two years after the city’s water treatment plant was updated with equipment to remove nitrates from the raw water, the plant is running at minimum capacity because the nitrate levels have been reduced by almost half thanks to the conservation efforts of farmers and ranchers upstream. Now, the treatment plant’s water is within legal safe drinking water requirements and treatment costs also have been significantly reduced. This is just one impact among many that show how a little conservation can yield big results for communities downstream. Thank-you for providing an example of protecting surface water (stream bank fencing) that actually improved ground water quality. This is source water protection at its finest. Great Job! Appreciate The ideas & Teamwork!